Buried Treasure is now a completed quilt. Yeah – number 11 for the year. 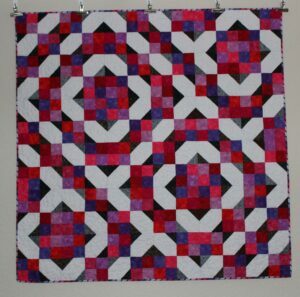 Because of the high contrast in this quilt, I used monofilament thread to machine quilt a meander motif. This project turned out even better than the idea in my head which is always a wonderful thing. I plan on keeping this one at my house for now.